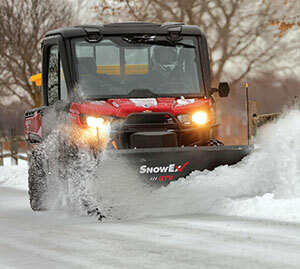 SnowEx is expanding its line of professional-grade snow and ice control products with the addition of its new Straight Blade Plow for UTVs. The plow measures 6-feet wide and can angle to 5 feet 4 inches wide for narrower applications. The plow features a full-trip moldboard to protect the equipment when encountering obstacles, as well as a high-strength base angle and A-frame. The UTV straight blade also has a 5-inch hardened steel cutting edge, and a Powercoat finish. Hydraulic components are protected with a durable poly cover. Operators can choose between the Power Grip hand-held control with backlit buttons or a compact joystick control. Both controls feature power “on” and float LED lights and use SnowEx Fleet Flex technology. The UTV straight blade contains four vertical ribs that provide additional reinforcement and stabilizing support. The blade is constructed of high-strength, low alloy steel components that are stronger and lighter than traditional steel. Additionally, the machine’s direct lift system can automatically lock the blade in position for clean scraping. SnowEx UTV straight blade accessories include deflectors, shoe kits, poly cutting edges, curb guards and a light bar.